Several years ago, while on vacation in Hawaii, I picked up a T shirt sporting a picture of the Hawaiian state fish. 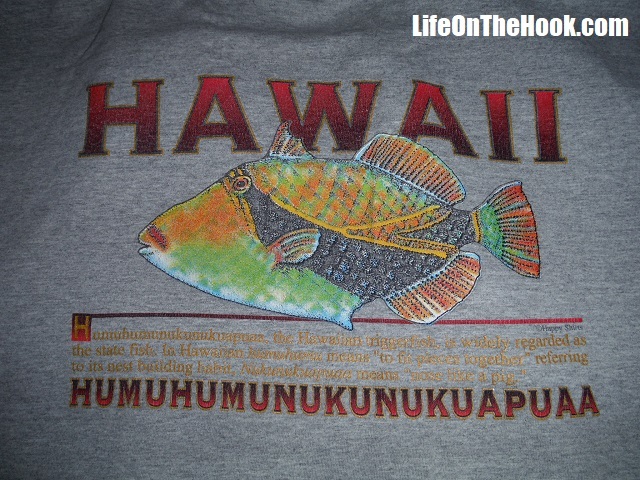 I liked the shirt because it showed the fish’s name in Hawaiian, which is Humuhumunukunukuapua’a. It’s a real mouthful to say, but after some practice it soon flows easily off the tongue, and even tickles a bit in the process. A year or so later, I was driving home from work (this was back in our pre retired-to-go-cruising days) and I found myself following a trailered boat by the same name. There plastered across the entire transom was Humuhumunukunukuapua’a. It just barely fit on a boat that was easily nine feet wide. I laughed out loud. Because the name just tickles my funny bone. You see, one thing we’ve learned in our travels is that sometimes a boat name works, and sometimes it doesn’t. And while it may seem as though an inappropriately named boat might be merely inconvenient, in our experience it can sometimes become a bit of a problem. So I find myself pondering the issue of how to choose an effective name for a cruising boat, and I thought I’d share a few thoughts on the subject. Now none of this really matters a great deal if your plans don’t involve cruising. But if you do intend to head out over the horizon someday, then here’s what it all boils down to. While cruising, you are going to find yourself interacting with foreign officials. They may not speak English very well (or at all), but they’re going to have to hear and understand your boat’s name. Second, you’re going to have to fill out forms and declarations that will require you to list your vessel’s name, and sometimes the space to write it isn’t very large. But most importantly, you’re going to find yourself having to use your boat’s name on the radio quite often. From speaking to bridge tenders to negotiating crossings with other vessels, responding to the Coast Guard or checking in and out with harbormasters, you’ll be on the radio a lot more than when you were weekend sailing around your local waters. And long, complex names just don’t work well on the VHF. The first tip I’d suggest when choosing a good name is to not use something that suggests nefarious intent. This would seem so evident that it hardly needs mentioning. Yet there we were in Marina Gaviota Varadero, Cuba, watching some very un-amused Cuban police detain the crew of an American flagged vessel that had just arrived. Their boat was named “Guns and Drugs,” and sported a large graphic of an assault rifle. Now this might have really cracked up the boys back in Miami, but it didn’t go over so well in Varadero. Our check-in only took two hours. We didn’t see the crew of Guns and Drugs for three days. So if you think “Human Trafficker” is a hilarious name for a boat, don’t be surprised if the Customs and Immigration officers fail to share in your mirth. I’d also recommend avoiding foreign phrases. If you think “Occupandi Temporis” or “Mi Velero Impresionante” is just so c’est chic, then have at it. 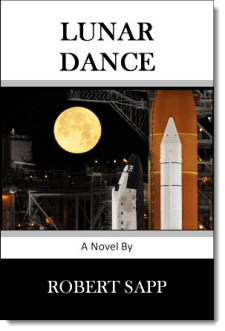 But please know that you’re going to be phonetically spelling it slowly and often on the radio, usually to someone who is dealing with background noise from boat or helicopter engines and can barely hear you. Most importantly, try to keep it short. When it comes to VHF radio communications, the shorter the better. One or two syllable words work best. “Ultimate Retirement Strategy” might expertly define your life situation, but it’s a mouthful to have to keep repeating to the Coast Guard every 30 seconds while reporting a vessel in distress. “Cool Sea Breeze” sounds lovely and is pretty easy to understand. But “Sea Breeze” is better, and the best option would be to just keep it to “Breeze.” Trust me, you’ll thank yourself in an emergency. A boat’s name can often be a highly personal reflection of the hopes, dreams or desires of its owners, but choosing an appropriate one can involve compromise. The point of all this isn’t to dissuade you from putting what you truly feel is the best expression of yourself on the back of your boat. We just wanted to give you a few things to consider when making your decision. Because I can only imagine the issues the crew of the good ship Humuhumunukunukuapua’a would face if they ever tried to take their boat cruising. This entry was posted in What?, Why? and tagged Boat Names, Cruising Boat Names, Humunukunukuapuaa, Naming A Boat on August 3, 2017 by Robert.